This week, Strawberry Singh and Mr. Winter Jefferson's challenge is about "Avatar look alikes". 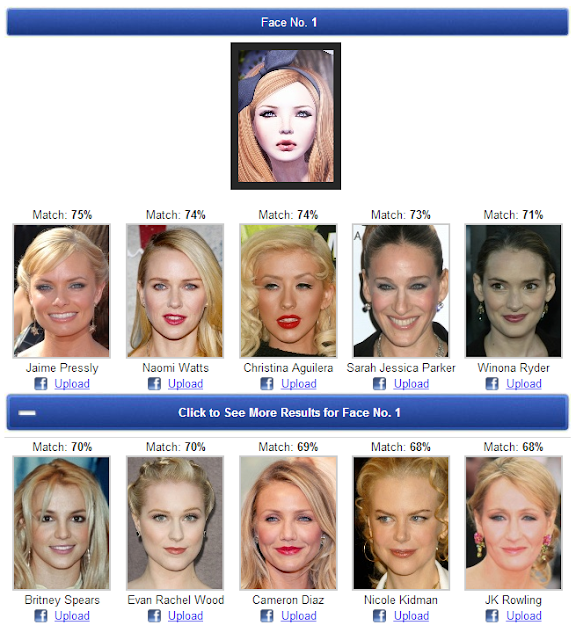 Have you created your avatar inspired by any celebrity or any person in particular? Meme Instructions: Share a selfie of your avatar and a picture of the person you feel most looks like your avatar, or someone people have told you looks like your avatar or someone you tried to base your avatar’s looks on. Don’t forget to share your meme pictures in the Blog Memes Flickr Group. You can read Strawberry Singh full post here. Personally, I don't think I've ever based the look of my avatar on any person, celebrity or not. I enjoy playing with the appearance editor sliders, and I just play with them until I am happy with what I see. But I tend to change my appearance too often because after some time I start seeing flaws on the face, or in the body.. so I start over again. Anyways, the first picture is the one I use for everything, from SL to every single social media profile. And I look like in that picture, most part of the time. I can see a resemblance to the first woman in my avatar, although this is the first time I see her, I think she's not very popular here in Argentina, or at least I did not know her. And thanks everyone for passing by, see you all in the next post. I think you're the only girl I've seen that didn't get any men in the results, you definitely are lucky, lol!